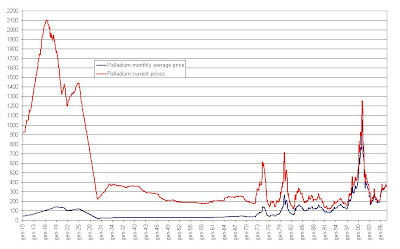 Buy Palladium: Inflation Adjusted Charts: Palladium History - Palladium Bottom is Now! Inflation Adjusted Charts: Palladium History - Palladium Bottom is Now! Here are a couple palladium price charts. The first one suggests that palladium is near its historical bottom. Palladium was once over $1000/oz palladium as you see, and now it's down around $200, which, if you factor in inflation, is similar to the beginning of the chart, which we'll call "bottom." And below is a palladium price chart dating back to 1910. The actual price of palladium, when our grandparents were growing up, was right around $100 for an ounce. However, if you factor in inflation you'll see how palladium (inflation) was well above $1500. Through the 40s, 50s, and 60s, you can see the price was cheap. Remember, until 1971 America was on the gold standard and gold was set at $32/oz, and palladium was pretty much based on the price of gold. However, look at the jumps after 1971 when Nixon took the US off the gold standard! Palladium had its jumps, any which of today would have taken palladium near the $1000 mark! These jumps were--if you adjust for inflation--higher than the spike to $600 palladium in 2008. Do you see how with gold adjusted for inflation the jump in 1980 would be like gold being worth $5000 an oz in 2009 dollars? Do you see how the lines narrow as we return closer to the present? This is because we can't factor in as much inflation, so, obviously, the price of gold today is the spot price quoted on any website. So, throughout the 80s and 90s, EVEN when adjusted for inflation, gold was cheap. Since the 2008 surge CANNOT be adjusted for inflation, because it is basically the same time as now, gold was and still is cheap, because it only reached $1000/oz. So, while the 1980 surge only reached $1000 as well, it was actually like gold being worth at least 4 times that much, due to inflation. In 1980, a regular car cost you $5000, more or less. Today it's $20,000, etc. For the record 1 oz gold is $940 Feb 14, 2009. And if the surge were anywhere near what it were in 1980, according to gold expert James Turk, gold would be over $6000 per ounce. If you can't grasp this inflation adjusted palladium and gold price, remember, that in 1980, 5 ounce of gold would buy you a basic four-door car. In 2009, for 5 ounces of gold to buy you that same car--which is now $20,000--only if it were at $5-6000/oz. Understand? In other words, gold and palladium is worth peanuts compared to the early 1980s! Next, let's look at it in reverse. This section may be difficult to grasp. The previous section was talking about prices in the 80s and 90s being adjusted for 2009 dollars. Now, let's look at 2009 palladium prices adjusted back to 1983 dollars. Here, the image is a normal Kitco chart in actual prices, and the black line is what gold prices would have been if the dollar had remained as strong as it were in 1983. Since you would only need $5000 1983 dollars to buy a car, you'd have to multiply today's dollar price by 4 to reach that same strength. In other words, you'd divide precious metals' prices by 4. Gold would be around $200/oz and palladium would be $50/oz. 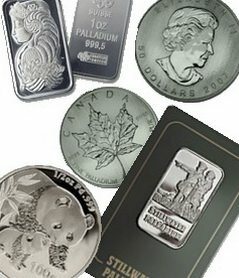 Did you know that silver actually reached $50/oz before? That was in 1980 as well. All precious metals rose Then. Silver bars, palladium coins, platinum, everything. Palladium demand and demand for platinum and other metals was up. Remember, we have to multiply by 4 to adjust for inflation when going back and forth between today and 1983, right? $50/oz x 4 = $200/oz. Only if silver were to reach $200/oz would we have a precious metals craze like which occured in the early 80s. For this to happen, we'd see the following prices. Gold is less volatile, silver is the most, so I've adjusted for that. If something were to happen to make prices jump as much as they were to jump in 1980, here are what the palladium and other metals prices would be. What's scary--or something to look forward to, depending on how much metal you own, is that there are so many more factors today leading to such a palladium price surge today compared to 1980! Gold - $6000/oz, as stated by many. Platinum - At least the $6000/oz of gold, but could be double gold, so perhaps over $10,000/oz! Palladium - $1000/oz. If a surge were to occur like in 2000, when it hit $1000/oz where demand for palladium demand was high, coupled with a precious metals rush, if platinum--a palladium substitute were already over $6000, palladium would be at $2-3000/oz! September 2009 Updated Article Here!